Written by: Bronwen Collins | August 22, 2018. We’ve discussed how to accessories a lot lately, but sometimes it’s easier to avoid it completely, and you just can’t be bothered. Accessorising doesn’t mean you have to wear a lot of bling. 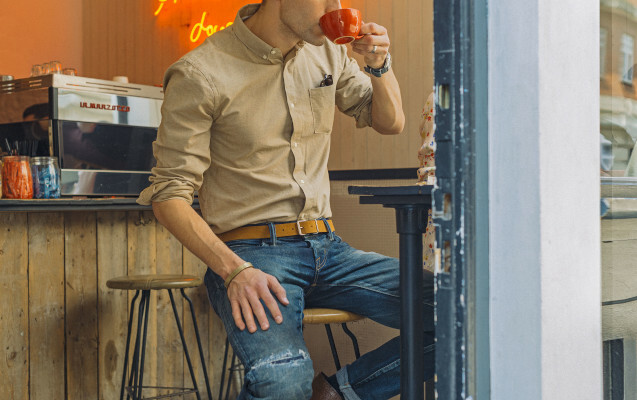 A humble belt can instantly upgrade your outfit, allowing you to look stylish with minimal effort – plus it holds your trousers up, win-win. Don’t just wear the same tattered belt every day because it’s your only one. It’s time to mix and match. To help you out, we’ll explain how to wear a belt, and how to match a belt with the rest of your outfit. What Size Should Your Belt Be? The first thing you need to know about belts is the size. Getting the correctly sized belt for your body is very important and can make or break your belt look. Plus, it’s kind of the whole point of having one. Ideally, when you fasten your belt you want to be using the third or fourth hole. This allows enough of the belt left over to pull through and slide through the loops on your trousers, but there’s not too much so the belt hangs down. It does occur to me, that if we always want to use the third or fourth hole, why bother having any more than those two? Best not to dwell on it. When you’re buying a belt, make sure you try it on. Don’t just presume you’ll be a medium because you’ve always been a medium; and don’t get offended at that idea. Different brands have different sizing’s. Ensure that it’s comfortable and don’t cinch you in. If your belt is the wrong size, it won’t matter if it’s the most stylish belt in the world, it still won’t look good! When it comes to suits, your belt will throw off the whole outfit if it doesn’t match. The general rule of thumb is to match your belt with your shoes. Black shoes = black belt. Brown shoes = brown belt. Pretty simple right? If you follow this rule you can’t really go wrong. If your suit is black then you don’t have anything to worry about, literally, everything matches with black. However, if you’re opting for a navy suit, then brown belts are best (and brown shoes for that matter) so be sure you get the right belt to match. Wearing all different colours, ie. black shoes, grey trousers and a brown belt, will make your outfit look cluttered and loud, taking away from the formal look you’re aiming for. Your formal belt should be subtle and understated, it’s there to finish the outfit off, not to be a loud statement piece. Find a belt between 2.5cm and 3.5cm in width. Finally, match the metal finish on your belt with your other accessories. For example, if your belt has a gold buckle, wear a gold tie clip, or pair a silver belt buckle with a silver watch. This will complete your outfit and ensure everything looks smart and matching. You have less to worry about with a casual belt, and can let your imagination run a bit wild. We’re talking loud colours, huge belt buckles, the works. As long as you’ve matched the width, colour and style, everything will look good. Width wise, skinny jeans require a skinny belt, between 1.5cm to 2.5cm. All other trousers (chinos, wide jeans and shorts) can have a wider belt. However, if you’ve considered buying a belt over 4cm in width, stop and think: will this actually look good? Do I look like a clown? Will it even fit through my belt loops? Material wise, you’re not just stuck with leather. Woven fabric, studded, embroidered, printed straps – there are endless styles out there, so you have no excuse to keep wearing your formal belt in casual situations. You don’t have to match your belt with anything in your outfit, and can choose a bold coloured belt to add a bit of flair to your look. The main role of a belt is essentially to divide your body into two halves, so keep this in mind depending on your body type. If you want to look taller, matching your belt with either the colour of your trousers or your upper half can lessen the effect of halving your body. Opposing, if you’re already tall then a brightly coloured or textured belt emphasises the divide, and can break up your vertical line. There really are no rules when choosing your casual belt, and you can be as subtle or as eccentric as you like. Just make sure the size is right and it’s a comfortable fit – so when you sit down your belt remains in place and doesn’t start to pinch you in the stomach. 1) Match your belt to your shoe colour. 2) Don’t go for too wide a belt. 3) Have fun with materials when it comes to a more casual look! So walk on with your new belt, knowing confidently that you look good, and that those trousers are staying up!